BRIAN HEAD – A Brian Head Ski Resort employee was arrested early Sunday morning for burglary and theft from the Navajo Lodge thanks to a tip from a passerby out for a late-night walk on the trail. The call came in at about 11:30 p.m. Saturday, Brian Head Marshal’s Office Deputy Jared Burton said. His shift was over at the time, he said, so he called another deputy to the scene. When the deputy arrived, Burton said, a door to one of the rooms at the Navajo Lodge was gaping open. The man who called the incident in said he watched a man walk out of the room carrying a box television, Burton said, and then put it into his car and drive away, leaving the door open. The witness said he stopped and watched because he knew the building should have been empty at that hour of the night, Burton said. The witness was able to describe the getaway vehicle in great detail, Burton said, which allowed the deputy to coordinate with an officer from Parowan Police Department to cut the alleged thief off at the pass. When the man, identified as 26-year-old Shelby Taylor Clark, of Cedar City, was pulled over by Parowan Police, Burton said, he presented the officer with keys and told him was an employee of the lodge and had borrowed the television from his work. The officer took Clark back to the room at the Navajo Lodge where the television had been taken, Burton said, and found that the unit had been ripped away from the wall causing damage. Clark was arrested on the spot. Clark was charged with third-degree felony burglary and class A misdemeanor theft, Burton said. Though Clark had keys to enter the room, Burton said, he had no right to enter the premises when he was off the clock without the express permission of the lodge owners. Because he did, the charge of burglary is relevant to the alleged crime. 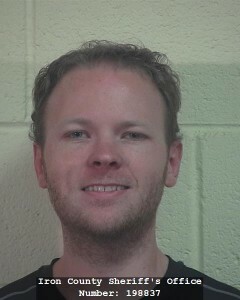 Clark was remanded to the custody of the Iron County Jail at 2:20 a.m. Sunday morning. His bail pending trial stands at $5,000. As of 5 p.m. Sunday, Clark was still in custody. Fun bag, I’ve taken notice of a few of your posts, You should really mix in some reality to your train of thought. @Noseitall- Agreed that this is barely news worthy. Must be a slow day. Possible good news for you Fun Bag. If your ever called for jury duty , and they take one look at your bias postings, your off the jury pool roster of possible fair & balanced citizens. You got it k wrong, they will keep him on the jury. Even the defense attorney will keep him because of his bias because of his honesty.. Many bias jurors have served on a jury. I saw a cat and a dog playing together. heck that sounds like news to me. Idiot. Now he has no tv and no job.